The 1,047-room Boca Raton Resort & Club straddles the Intracoastal Waterway roughly halfway between Palm Beach and Ft. Lauderdale. On the mainland side stands Addison Mizner's ornate 1926 Cloister hotel and the new 112-room Yacht Club, which faces the Intracoastal Waterway, and a cluster of Boca Bungalows along the golf course. Boats and shuttles leave from the main complex for the recently renovated Beach Club, a seven-story complex of rooms, restaurants, and swimming pools fronting a half-mile of private Atlantic-washed beach on a barrier island just across the Intracoastal. Tennis at the resort took on a new dimension with the debut in March of 1998 of the $10 million Tennis and Fitness Center and again late in 2001 with the opening of the palatial Waldorf Astoria Spa (formerly the Spa Palazzo). Architecturally, the new clubhouse looks like a contemporary of the neighboring Cloister. From the hotel a path along the croquet courts leads to a two-story Mediterranean-inspired structure tricked out in the same pink stucco and barrel tile as Addison Mizner's original. Straight ahead double wooden doors on the first floor open onto a bright fitness center full of state-of-the-art cardiovascular equipment and Cybex workout stations, while to the right and left twin stone staircases lead to an arched and pillared second-floor arcade and the entrance to the expansive tennis shop. Rich in wood trim and a large selection of well-displayed clothing, this 5,000-square-foot retail outlet looks more like a boutique than a full-service pro shop. Behind it a covered deck extends above the fence line of courts Nos. 1 and 2 and provides a panorama of the complex. The courts themselves, 18 in all, are arrayed to either side of a brick-lined alleyway, decorated with benches, trees, and flowers. All of the courts are clay with a subsurface watering system called HydroGrid. What you cannot see from this perspective is that this entire complex of 18 courts sits atop a parking garage. The effort that went into the new complex is being matched by the efforts of the staff to take good care of tennis players. Chief among the services is a well-honed system of finding matches for guests, typically by calling on local members. 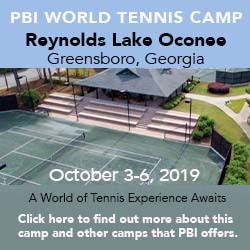 To do that the resort designates some of its staff as "tennis concierges," with the responsibility not only to set up games but also to carpenter together a personalized tennis program, including any of five daily clinics, tennis aerobics, and occasional round robins. The man behind the programs is director Erik Silver, who has been on these courts since he first started to work there at age 14. When you walk into the pro shop, through the double doors, you come face to face with a raised counter and two tennis concierges eager to arrange matches or create an individually tailored program from the week's menu of activities. That and the physical beauty of the complex make an indelible first impression. Tennis Staff. With his model-like looks and long wavy dark brown hair, tennis director Erik Silver looks the part of a resort tennis pro. His mother is a long-time member, and Silver first began working with the colorful Warren Woodcock, a former director, in 1978. After eight years as head pro, he took over as director in 1996. He has assembled a large staff of very personable pros, including his assistant director Brett Maynard, head pro Larry Gottfried, and an attentive crew to man the pro shop. Tennis Programs. Apart from game matching, which is handled by a "Tennis Concierge", and private lessons, the staff runs 5 to 6 daily clinics, a few weekly round robins, and tennis aerobics. For kids, they offer a once-a-week Mighty Mites program for 3-4 year olds and Tiny Tots sessions three times a week for those ages 5 to 7. Court Fees: $22/person before noon, $12/person after noon. Beach. The Beach Club, across the Intracoastal Waterway on a barrier island facing the Atlantic, fronts half a mile of private beach, furnished with padded lounge chairs with fold-up canopies each with an individual flagpole to use to request beverage or other service. Golf Courses. The resort has two 18-hole courses. It is also home to the Kellie Stenzel Golf Academy and the Dave Pelz Scoring Game School. Resort Course: Reconstructed and reconfigured in 1999, this course now features water on most of its fairways, including the 18th, which has an island green. Par 71. Length: 6,253 yards from the back tees. Country Club Course: Also redesigned in 1999, the Country Club course features contoured greens and many deep, greenside bunkers. Par 72. Length: 6,714 yards from the back tees. Spa & Fitness Center. The 6,200-square-foot fitness center at the tennis courts has a full line of aerobic and cardiovascular equipment as well as a set of Cybex stations. Its exercise studio schedules a variety of aerobics and toning classes, and personal training is available from the staff. The resort also has a second fitness center at the Boca Beach Club and a third at the Boca Country Club. Just across the road from the tennis center stands Waldorf Astoria Spa, a 50,000-square-foot sanctuary with 44 treatment rooms, an opulent wet room, an eclectic menu of spa treatments, sunning terraces, and an additional 10,000 square feet of gardens with waterfall whirlpools and a spa pool with underwater music. And ... The resort has seven swimming pools, one at the Cloister, three at the Beach Club, and one each at the Country Club, Boca Bungalows, and Waldorf Astoria Spa. The resort also has a full-service marina immediately adjacent to the historic Cloister on the Intracoastal Waterway. It has 32 slips and can accommodate sailing vessels up to 170 feet in length. There are also croquet lawns, racquetball courts, volleyball, basketball, and badminton. Children's activities and recreation are divided into three groups by age: Boca Tots, ages 3-5; Boca Bunch, ages 6-12; and Boca Sport, ages 12-17. The nostalgic first choice in lodging would seem to be the historic Cloister hotel until you discover that its quarters seem small by today's standards and at best have views of the golf course. As a result, those who adore the beach will opt instead for the recently refurbished rooms at the Boca Beach Club, even though that puts you a shuttle or boat ride away from the tennis courts and many of the restaurants. The South Tower thus stands out for its convenience, the spaciousness of its rooms, and the glorious views from the mid to high floors. Those who want seclusion can opt instead for the Boca Bunaglows, some of whose rooms and suites have kitchens. The newest lodging is in the luxuriously appointed Yacht Club, whose design resembles a Venetian palace. Rather than have a single chef oversee the entire resort operation, the Boca Raton brought in outside chefs for some of its restaurants. Of the dozen or so food outlets on property, the signature restaurant is Cielo, which recently became the province of Michela Larson. From its location on the 27th floor, it looks up and down the Intracoastal Waterway and in a state as flat as Florida seems to afford the ability to see forever. Among the other notable options are noted restaurateur Drew Nieporent's Tuscan-inspired Lucca in the Cloister Piazza and SeaGrille at the Boca Beach Club, where it serves fresh local seafood and salads. Lodging consists of rooms in the original Cloister, others in the Tower immediately adjacent, still more across the Intracoastal Waterway at the refurbished Beach Club on the beach, the Bungalows on the golf course, and finally the new Yacht Club. Seasons. Although the resort is open year-round, summers in south Florida are hot and steamy and tennis activity wanes. Rates are almost half what they are in winter, however. Travel Instructions. By Air: Palm Beach Airport is 28 miles to the north, Fort Lauderdale is 24 miles to the south, and Miami International is 45 miles south. By car: Take I-95 or the Florida Turnpike to Camino Real and head east. The Resort located between U.S. 1 (a.k.a. Federal Highway) and Highway A1A. General Tourist Information. Visit the Palm Beach County Convention and Visitors Bureau website or contact them at 1555 Palm Beach Lakes Blvd., Suite 204, West Palm Beach, FL 33401. Phone: 561-471-3995.